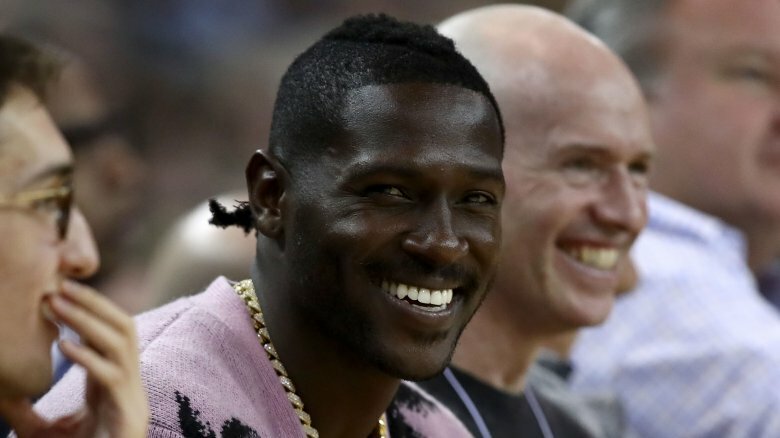 Antonio Brown is one of the biggest names in the NFL and, arguably, in all of sports. The legendary wide receiver is also a social media giant, meaning he makes noise both on and off the field. But, in 2019, Brown's name has been front page news, seemingly for all the wrong reasons. He's been involved in lawsuits, traffic offenses, team disputes, and accused of things even worse than all that. Exactly how much fault Brown has in some of these matters is still unclear, as of this writing. What is clear, however, is that Brown's latest issues are just part of his larger story, a story that is marred with struggle and challenges. It's partly because of his own difficult upbringing that Brown now participates in charitable efforts for schools and kids. His non-traditional path to the NFL inspired him to help youths overcome life's many obstacles. With that in mind, we decided to look at some of Brown's obstacles in more detail. 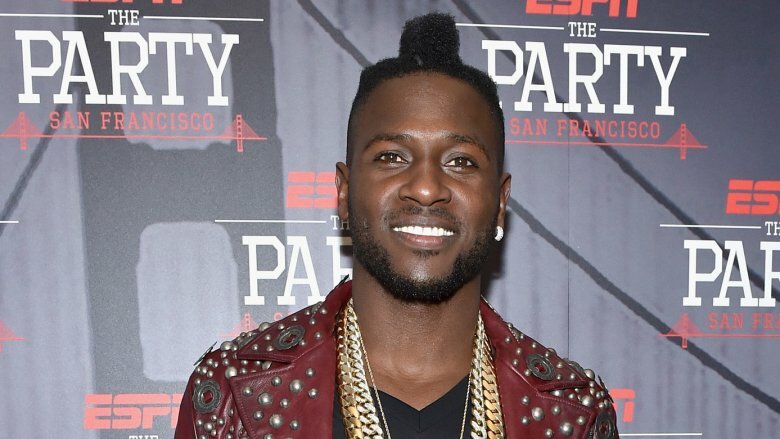 Here is an inside look into Antonio Brown's tragic real-life story. 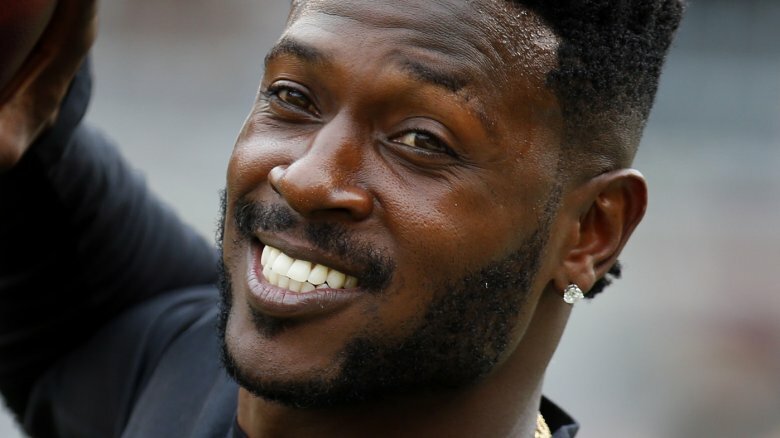 In Northwest Miami, there's a little neighborhood called Gwen Cherry Park that has fostered some incredible athletes, namely NFL stars Amari Cooper, Santana Moss, Chad Johnson, and Antonio Brown. Yet, while this low-income neighborhood where football reigns supreme seems to grow NFL legends from the ground, those that grew up here faced many challenges. According to ESPN, one of Brown's earliest memories "was watching a man steal a purse from his elementary school teacher, dashing away as the shocked students looked on." As he got older, his friends joined gangs and nearly every party he went to "ended in a shootout." Brown's childhood football coach, Tyrone Hilton, the father of fellow NFL star T.Y. Hilton, said that he's had three players murdered. For that reason and more, those that those that get out of Gwen Cherry Park tend to stay out. At least, that was the case with Brown. According to Hilton, "When he left the park, he disappeared." Antonio's father, Eddie Brown, was a football star in his own right. Considered the greatest Arena Football League player to ever play, according to a 2006 vote (per ESPN), Eddie didn't see his son Antonio much when he was growing up. The same outlet reported that after spending a few months with his father in 1996 when he was eight-years old, Antonio became estranged from Eddie for many years. At home, Antonio's relationship with his mother's husband was strained as well. 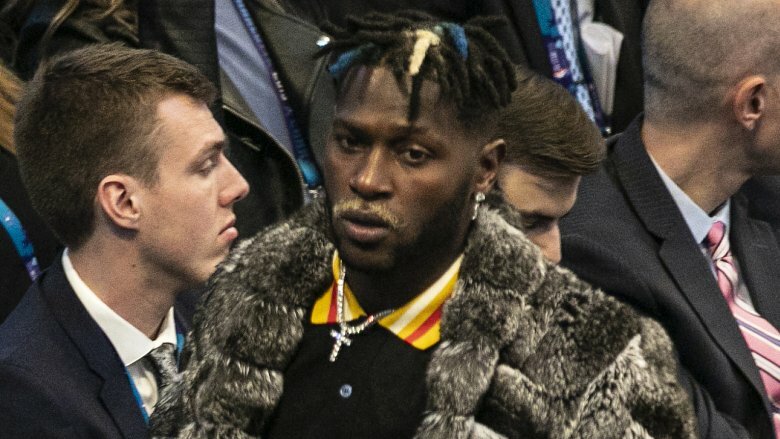 ESPN also reported that "a falling-out with his mother's new husband," Antonio left home, crashing with friends and "sometimes sleeping in cars." Asked about this tumultuous period during an on-camera ESPN interview, Antonio described his childhood as "a little rough," adding that he "had to live with teammates and kind of find a way for myself." Despite the challenge of the experience, Antonio explained that it taught him "to never take anything for granted." Playing high school football at Miami Norland, Brown put up big numbers and earned several accolades, but it wasn't enough to take him to launch him the next level. While there was interest from some of the big colleges, Brown's grades were not strong enough for consideration. Scouting interviews also proved a challenge. When Bowling Green sent Zach Azzanni to meet and recruit the talented athlete, the meeting was conducted on the street, where Brown stood next to his bike. "I literally met him on the corner," Azzanni told ESPN. In the end, no offers from any "major" Division-1 schools came. Brown's first choice, Florida State, denied him because of "academic concerns." He then tried Alcorn State but discovered that his test scores weren't high enough. After boosting his test scores and earning a scholarship to Florida International University (FIU), Brown was then involved in an altercation on campus. According to ESPN, his scholarship was rescinded before he ever took the field for the team. School officials allegedly told Brown, "we're gonna say you were never here." After Brown was removed from FIU and he returned home, he got a call from the former Bowling Green recruiter, Zach Azzanni. Now with Central Michigan, Azzanni encouraged Brown to try out for the college's team as a walk-on receiver. So Brown took his shot. He flew into to town with all his belongings, none of which were winter clothes, and made the team. According to Bleacher Report, Brown became the school's all-time receptions leader, and finished in the top three all-time for reception yards and touchdowns. "He was the best player in that conference, hands down, at the time," Azzanni said. "There was nothing else for him to prove other than, 'Hey, I can do this at a bigger scale.'" Determined to make the NFL, Brown then attended the NFL combine and was selected by the Pittsburgh Steelers in the sixth round. Nine years after leaving Central Michigan, Brown said of the school, "This is where it all began.Nobody believed when I was here, and nobody thought I'd be where I'm at. It's all about doing things people wouldn't expect you to do while coming from a place they wouldn't expect you to come from." In order to boost his standardized test scores, Brown attended North Carolina Tech Preparatory Christian Academy. Since he left, the school has had a few critical pieces done on its practices. An ESPN "Outside the Lines" report, for example, highlighted several controversies regarding the school, including no physical classes on-site, predatory recruiting practices, fabricated team records, and questionable educational standards. Local news station WBTV's "Problem Solver Investigation" segment also looked into the NC Tech program and raised concerns about its academic integrity. Following the segment, the NCAA issued a news release, stating it "will not accept core courses, grades, and graduation" from NC Tech. But the story was linked to Brown when it was learned that NC Tech program recruiters were allegedly using former students, like Brown, as part of their sales pitches. "Well, it's sad. It's misleading," Brown said of the controversies regarding his former school. "I feel like as a coach you're responsible for telling the kid what's beneficial or what's best for him. And not misleading him. … So it made me look at it as maybe he's running something that's not really right." Being a celebrity often means seeing your personal life discussed by the media and devoured by the public. 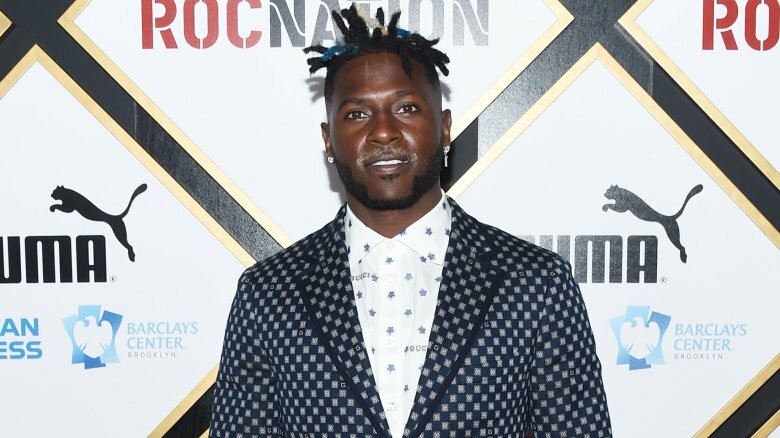 While Brown is no different, he feels and speaks about the pressure in a way that many celebrities and athletes don't. "You guys write about me every day," he said to reporters. "My mom and kids see it, so we have to deal with these type of things. … I started to think to myself, am I really free?" But by expressing his feelings, Brown didn't free himself from the constant coverage or the scrutiny. In fact, it may have gotten even worse. In September of 2018, The Undefeated published a thorough piece on Brown. When the wide receiver learned that the writer, Jesse Washington, was reaching out to people close to him, he didn't take it lightly. Brown sent Washington a direct message on Instagram that stated, "Bro stop hitting my people up looking for stories stay in your lane." Washington published the message in the story. After that, Brown sent an ill-advised threat to Washington in a now-deleted tweet, telling Washington, "Wait [till] I see you bro we gon see what your jaw like." Brown later apologized for reacting that way. Brown is used to being doubted by those around him. He penned a piece for The Players' Tribune entitled "Destroy Doubt," in which he wrote, "I'm not six foot five. I'm not 250 pounds. I've been overlooked. Doubted." In Brown's scouting report from college, his size was questioned, so too was his work ethic, mental fortitude, and attitude. 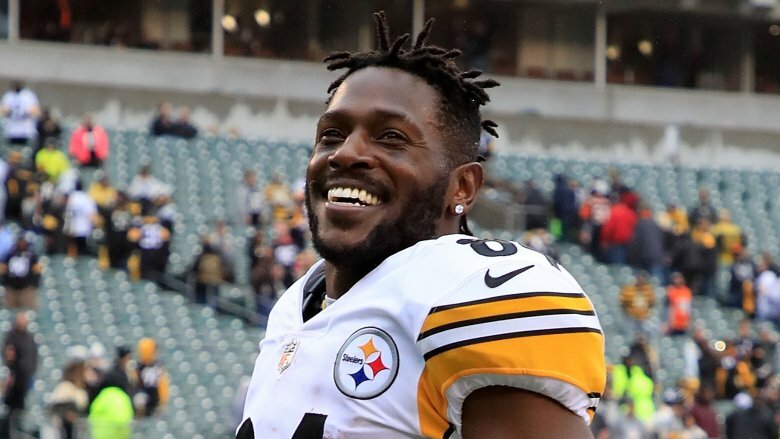 Brown remembered all these doubters when he gloated in a Facebook Live video from the Steelers' locker room after the team advanced to the AFC Championship Game. "For those who didn't believe — look at me now," he laughed. "For the time they locked me out the crib they didn't let me in, haaa! You played yourself. For the time they didn't recruit me to go to college — haaaa! You played yourself. For the people who rolled up and said I was too small — aahh, haaa." Yet, despite having some of the most prolific numbers in NFL history, it seems that Brown still isn't past the doubt. 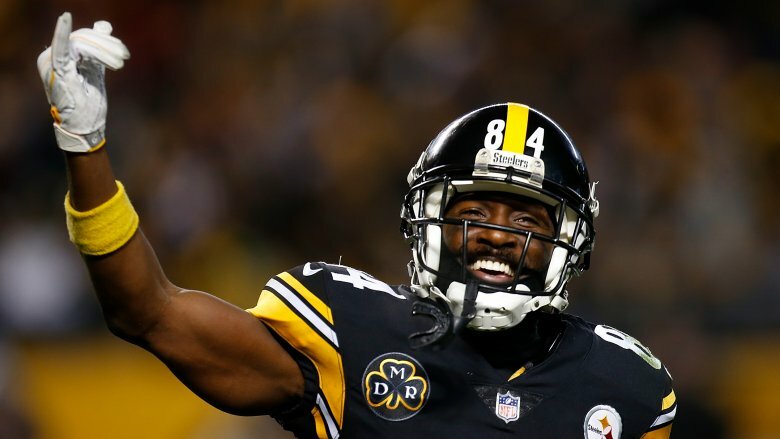 Ryan Scarpino, a long-time public relations assistant with the Steelers, tweeted, "AB needs to thank his lucky stars, because he was drafted by a team that had Ben [Roethlisberger]. And Ben got AB paid. You know darn well he wouldn't put up those numbers for other teams." To this, Brown tweeted (via Bleacher Report since he later deleted it), "Trade me let's find out." 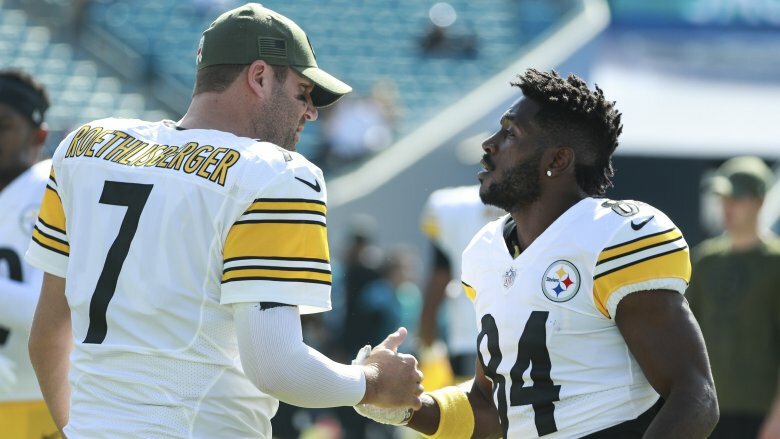 Since joining the Pittsburgh Steelers, Antonio Brown and quarterback Ben Roethlisberger have had some heated on-field discussions. It seems that, on most of these occasions, Roethlisberger was quick to put the blame on Brown. 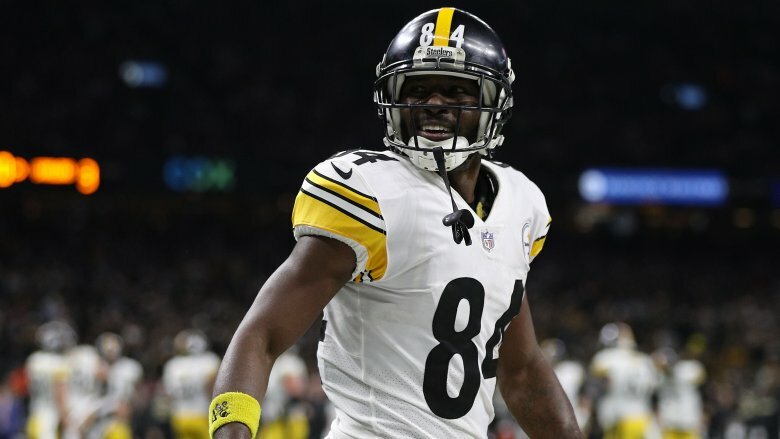 The wide receiver letting his temper get the best of him on the field, for example, was "causing a distraction that none of us really need," according to Roethlisberger. Other times, the quarterback publicly called Brown out for running the wrong route. Yet, while there appeared to be tension between the two athletes, both were quick to shut down any divide. 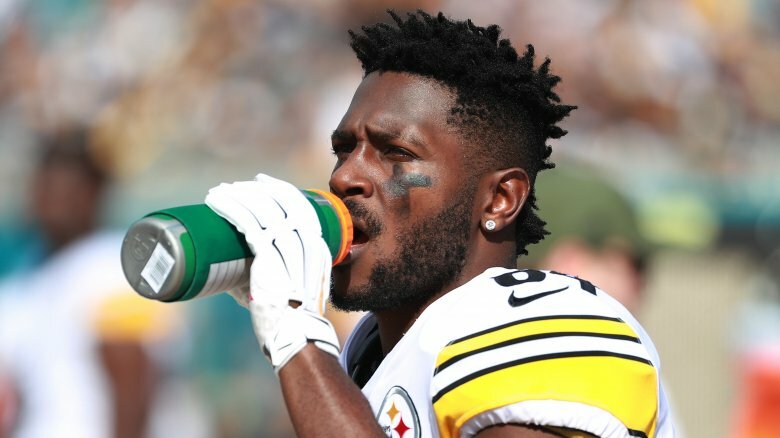 Brown confirmed that "Ben loves" him and doesn't need to apologize for showing emotion, and Roethlisberger insisted that there was "no issue in our locker room" and no issue between Brown and him (via Pittsburgh Post-Gazette). But then Brown got talking on Lebron James' The Shop and the truth seemed to change. "All year, the dude called me out," he said of Roethlisberger. "We lose a game, he like, damn, AB should have run a better route." When asked why, Brown responded, "That's the type of guy he is. He feel like he the owner. 'Bro, you threw the s**t to the D-lineman! How the f**k I'mma run a better route?" In October of 2018, TMZ published reports of a lawsuit against Brown from events that dated back to April of the same year. According to the lawsuit, a young child and his grandfather were walking around the pool of an apartment complex when furniture from one of the apartments above came crashing down. The items included "2 very large vases, a heavy ottoman and other pieces of furniture — which landed within a mere foot or 2 from the toddler and his grandfather." Reportedly, surveillance video alerted security to Brown's apartment and police were called. When they arrived, "Mr. Brown was extremely agitated, acting aggressively, and yelling at security personnel." TMZ then suggested Brown may have been agitated because he noticed that $80,000 and a 9mm gun was missing from his belongings. While Brown was not arrested, the apartment complex reportedly began the eviction process and another lawsuit was filed for further damages. Afterward, Brown released the statement: "It has now been made public that two lawsuits containing false claims have been filed against me. The facts will soon come out that prove my innocence." In the court records, Brown allegedly stated that "The acts were committed by another individual who was also present at the time of the incident." 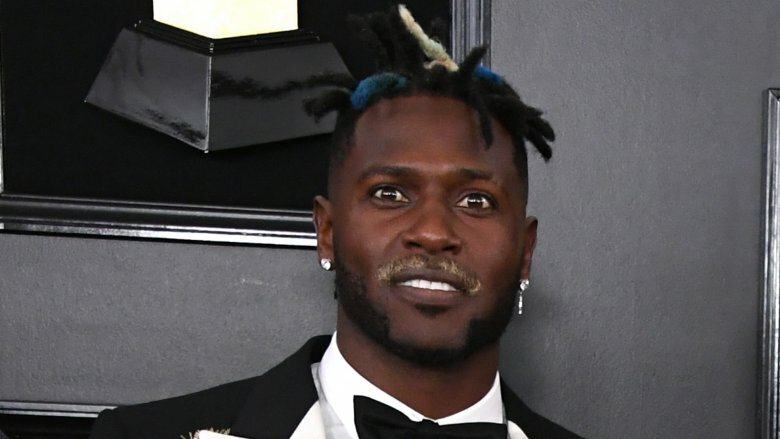 In early February of 2019, reports surfaced of an alleged domestic violence dispute involving Brown and the mother of his child. According to TMZ, the incident occurred in late January. Brown's attorney called the accusations, "baseless and false." Shortly afterward, talk show host Andy Slater tweeted out the incident report, which detailed an argument between the two parents over reimbursement for their daughter's haircut. According to the report, Ms. Jackson was shoved to the ground by Brown in the altercation, but she was unwilling to "complete a victim affidavit." TMZ later reported that Jackson attempted to "cancel her report" but was unable to halt the process of the investigation. A couple of weeks later, TMZ published pictures of the injuries Jackson allegedly sustained, which "show a very minor scratch on her forearm." Despite the closed case and the attempt to retract the report, the event took a toll on Brown. He was investigated by the NFL and the Pittsburgh Steelers. Due to these events and the allegedly false accusations, Brown's lawyers reported that the NFLer will seek full custody of his daughter. According to the Pittsburgh Post-Gazette, Brown was then found guilty of the charges of reckless driving when he "skipped" his court date. Represented by his lawyer, Brown's whereabouts during the court proceedings were undisclosed. When he was asked about the speeding ticket in his sit down with ESPN, Brown shared his side of the story. "The police pulled me over and say I'm a suspect for a bank robbery," he said. "So the guys call more police. They take pictures of me. … Now I'm on the news." He then explained what happened with the court proceedings. "Then, they want me to go to court for a speeding ticket," he said. "I send my lawyer. Then it's like, the media waiting for me, I don't go. Now it's a big deal." Brown did finally request a trade and made it official, sort of, through Twitter. 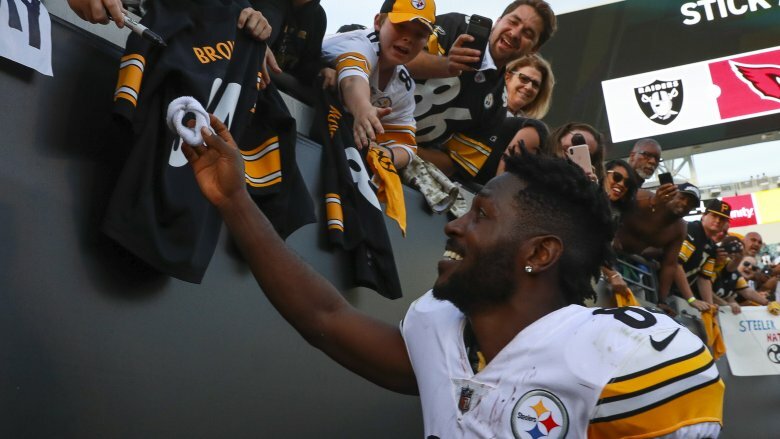 Brown tweeted a highlight reel of his NFL career with the message, "Thank you SteelerNation for a big 9 years…time to move on and forward." Later, while on The Shop, he disclosed what happened with that last game and what led to the breakdown. 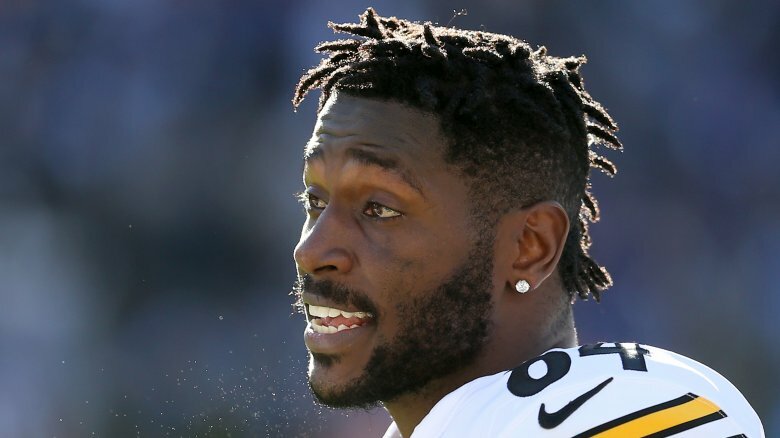 "I'm a little banged up, so I meet with coach Tomlin and I'm tellin' him, like, 'hey man, I'm a little banged up, so I'mma need a little time to get right.'" Brown explained. "He like, 'You banged up, man, just, you know, you just go home.'" According to Brown, it was at that moment that he realized, "Damn, that's where we at?" In the end, the Steelers traded Brown to the Oakland Raiders, ending one of the biggest sagas in sports.